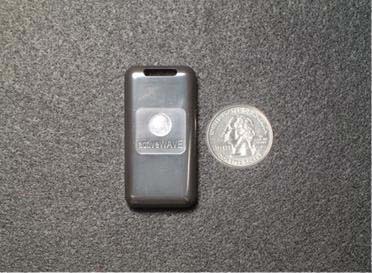 The ActiveWave compactTag is the size of a car remote and is ideal for inventory control and asset tracking applications. The compactTag can be used to track and monitor equipment in an office, warehouse, or any other type of facility. For example, compactTags can be configured to track cars in a rental lot, monitor bins in a factory, find specific crates in a warehouse - basically any application that requires system monitoring of assets. When compactTags are used with cardTags, all movement of valuable assets without an assigned owner will immediately generate system alarms and can securely lock exit doors. Typically, the compactTag remains in sleep mode until it receives a wake up command from an ActiveWave Reader or Field Generator. If the command is intended for this tag (specific address or broadcast), then the tag will awaken and transmit its ID and other information to an assigned system Reader. The tag can also be configured to automatically wake up at predefined intervals, transmit its information to the system, then go back to sleep to conserve battery life. Unique anti-collision algorithms are used to ensure that all tag data is received, even when multiple tags are transmitting at the same time. To guarantee that all data remains accurate, all tag packets use reliable cyclic redundancy checks. Several compactTag versions are available, each using one frequency for transmit and another frequency for receive. This dual-frequency method allows for fast and reliable communications. Other compactTag options include a bracket, LED, buzzer, and various amounts of user memory ranging from 0 to 256Kbits. Even more peripheral options may be added to satisfy your application needs. Traditional method of Access Control, Asset Tracking, and Inventory Control are limited and outdated. Access Control methods range from security guards to employee badges that must be swiped or placed close to a passive RFID proximity reader. Tracking methods are either entirely visual - dependent on security guards or surveillance cameras - or too costly such as GPS. Inventory Control methods require much money for complex enterprise software, and much more time and manpower for physical counting. Barcode scanning requires line-ofsight, close distance, and clean, undamaged barcode labels. None of these traditional methods offers a solution that is completely handsfree, automated, reliable, and that can save your business thousands. ActiveWave's active RFID solution offers numerous advantages over traditional methods. Valuable items are easily tracked throughout a facility by simply attaching an ActiveWave tag. Alarms are automatically generated for unauthorized movements through specified doors and at specified times. This same concept applies to tracking people as well. In fact, ActiveWave's Host software ties together both people and assets such that certain assets can only be moved by authorized people. For inventory counts, ActiveWave tags can automatically wake up and report their presence on a periodic basis. If a tag misses its scheduled "check in" time, then the Host can generate an alarm so the loss can be investigated immediately. New items are added to the count by simply moving them into the warehouse. Imagine the savings of automated, hands-free, daily updates to your entire inventory. How else can ActiveWave help your business? Visit our web site at www.activewaveinc.com. Everything is available under the Apache 2.0 license. Visit our repo at https://github.com/tourajghaffari/tigerfid for all the files to build your own ActiveWave products. NOTE: The information in this datasheet was accurate as of February 10, 2017. Everything is subject to change based on the work done on the repo. Want to build your own ActiveWave products? Click here to visit our repo for all the required files for our total RFID solutions! ActiveWave is now TigeRFID. Everything is available under the Apache 2.0 license. Visit our repo at https://github.com/tourajghaffari/tigerfid for all the files to build your own ActiveWave products.